If your cat has been nibbling on your houseplants or flower arrangements, it may be time to grow him an indoor garden of his own. Cat grass is actually oat, wheat, rye grass or a combination of the three. 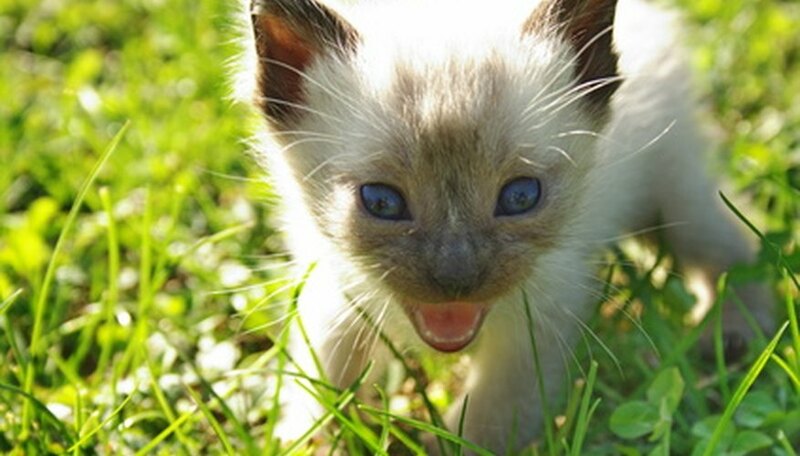 Most cats enjoy nibbling on the grass and they derive some nutrients from it as well. Growing cat grass indoors in a pot gives indoor cats a taste of the outdoors. Begin growing cat grass for an adult cat or a new kitten, as it may encourage them to chew on the grass instead of an ornamental potted plant. Fill a 6 to 8-inch diameter pot with a quality potting mix. Leave a 1 inch space between the top of the soil and the rim, so the soil doesn't wash out when you water the grass. Sprinkle one to two pinches of cat grass seed on the soil surface. Spread the seeds evenly over the top of the soil, then cover them with a 1/4 inch layer of more potting soil. Water the soil until the excess moisture begins draining from the bottom of the pot and into the drip tray. Allow the excess moisture to drain for approximately 30 minutes then empty the tray so the pot doesn't sit in standing water. Place the pot in a sunny window sill. A south or east facing window is best, but any window where the pot receives around six hours of sunlight suffices. Water the soil as needed to keep it moist but not soggy, emptying the drip tray after each watering. Move the pot to an area that receives sunlight but is within reach of your cat once the grass is 2 inches long. Plant new pots of cat grass on a three to four week schedule and rotate them out as one begins to die or become over-chewed. This ensures that your cat always has fresh grass available. Cat grass seed is available at pet stores and from seed suppliers. Even if you are growing cat grass, take the precaution of keeping harmful plants where the cat can't get to them. Some plants, like lilies, can cause death if the cat eats it. Is Variegated Ribbon Grass Poisonous to Dogs?